I am at the moment writing on a scientific article comparing two surgical techniques and such work definitely needs a cake or two 🙂 I’ve been working on the project for 7 month and are finally beginning to see the end of it! Today the writing went well and I decided to reward myself with a cupcake experiment. The choice of lime and coco milk came from a quick look in our pantry, that among other things contained a lot of limes a single can of coco milk. Unfortunately the coco milk was a light version (only 8% fat) and the taste of coco was not as strong as I had wished, so next time, I will definitely use a full-fat version. If your are not a fan of lime you can use lemon instead, but I will recommend that you try it with lime first as it is a perfect match for coco milk 🙂 Hope that you will love them as much as I already does. Place butter and sugar in a mixing bowl and whisk until light and fluffy. scrape the sides of the bowl if necessary. Add the eggs one at time and whisk until incorporated. then add the vanilla extract. Combined flour, baking powder and salt in another mixing bowl. Add the flour mixture to the butter and eggs mixture alternating with the coco milk, lime juice and zest. Scrape the sides of the bowl again, if necessary. Only whisk until the batter is combines. Over-whisking the batter might ruin the end result, as the fluffiness of the batter will disappear. Line standard muffins tins with paper liners. Fill each paper line with 1 tbsp. of the batter and bake at 400F for approximately 16-18 minutes or until a toothpick comes out clean. Place all three ingredients in a mixing bowl and whisk until smooth and fluffy. Put the frosting in a piping bag with your favorite piping tip (this one is a 1/-inch round pipe) and decorate the cakes. 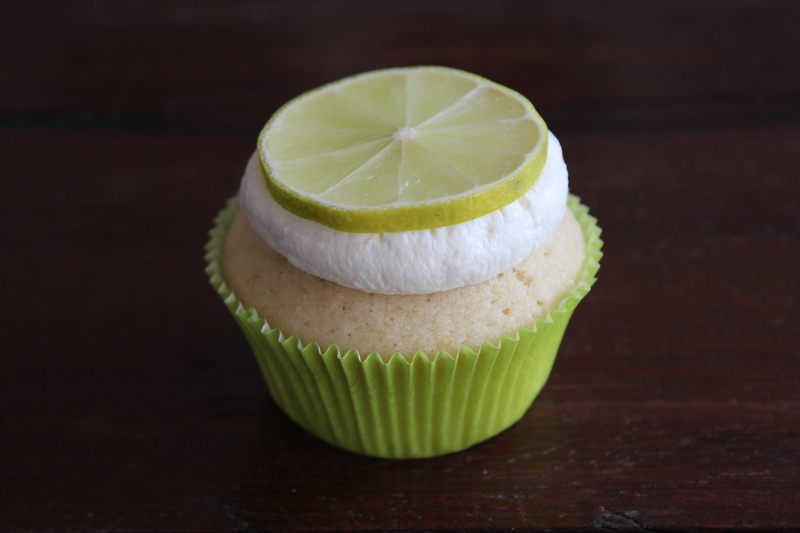 Cut the limes into thin slices and place slice on top of the frosting and press it slightly down. Back in 2010 we went on a 6 week road trip in Georgia, Florida and South Carolina. Before taking the trip we had watched the movie and decided to make a short stop in Juliette, GA where the movie was shot, on our way from Atlanta, GA to St. George Island, FL. 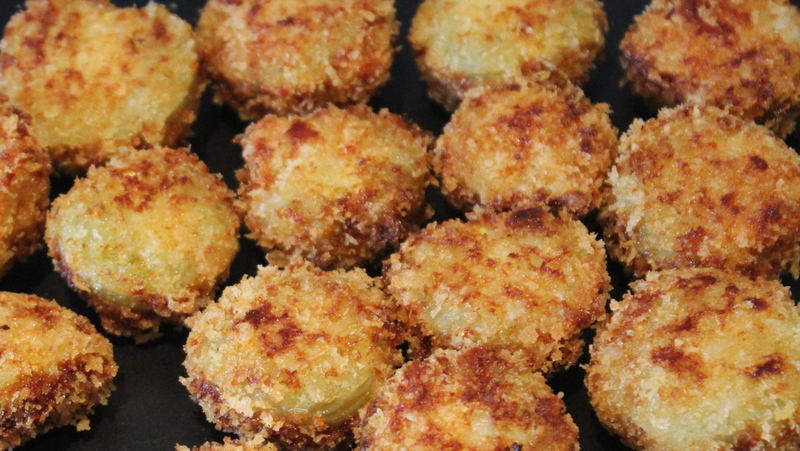 As often as possible – the tomato season – we make these fabulous tomatoes as snacks. 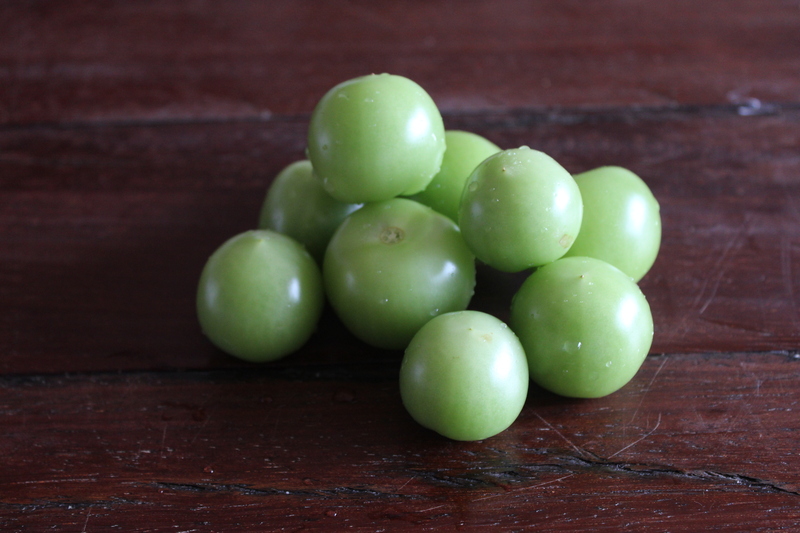 In the beginning of the tomato season we have to order the green tomatoes at the local farmers market, while there are no problem getting them in the late tomato season, as many people make pickled green tomatoes. Cut the green tomatoes in half if you use small tomatoes. If you use regular sized tomatoes, cut them into 1/2 – 1 inch slices. Combine flour, salt and pepper. Turn the sliced tomatoes in the flour followed by the the buttermilk and then the breadcrumbs. 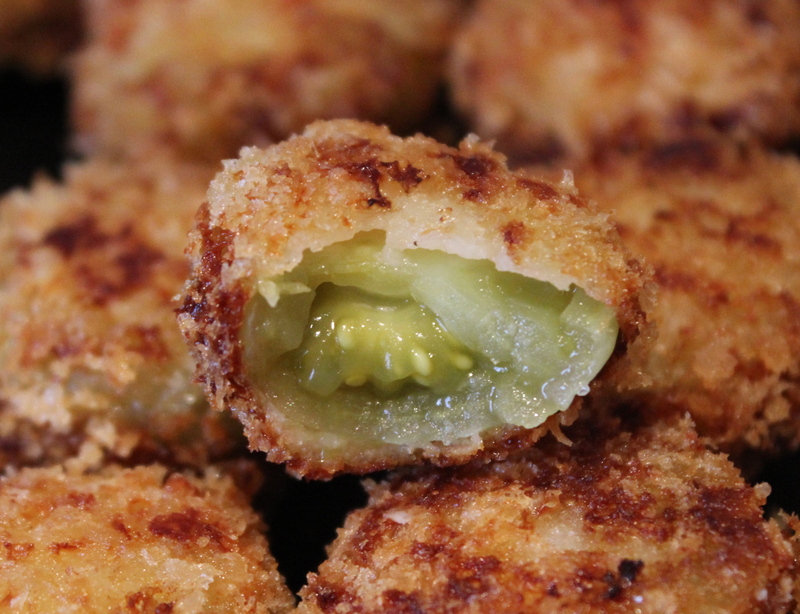 Place the breaded tomatoes in the fridge for about an hour before frying them. Fry the breaded tomatoes for a minute or two on each side or until they golden brown. A few weeks ago we had a colleague of Chris’ and his wife over for dinner and wanted to make something easy, as we only had little time. We decided to make steak sandwiches with dipping sauce, and now you might think “that doesn’t sound like something you serve for dinner on a friday night”, but you cannot be more wrong- it is the perfect friday night dinner, when all you want is to spent time with good friend, and stand in the kitchen cooking all night. Fire up the car kettle grill and let it get hot (approximately 400F) while preparing the meat. 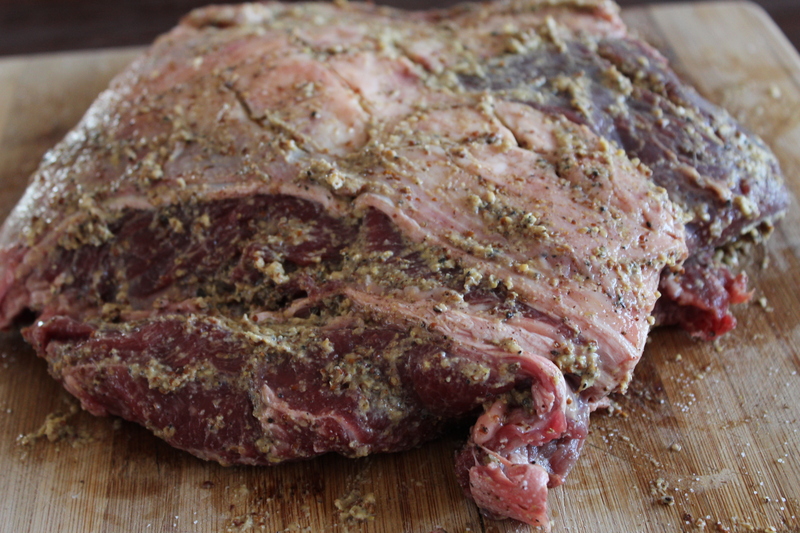 Season the roast with salt, pepper and mustard. 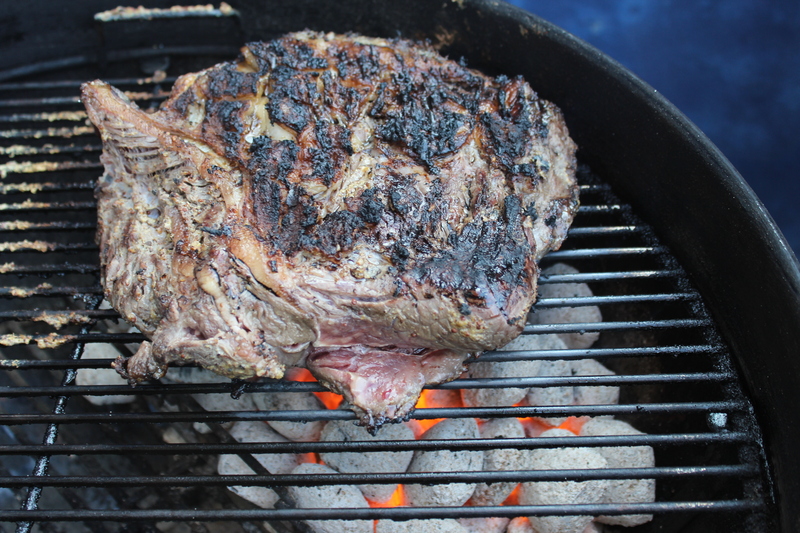 Sear the meat on both sides before placing it on indirect heat with the lid on. Roast the meat until you reach a core temperature of 130-135F if you’d like it to be medium-rare or 140-145F if you’d like it to be medium (but for God’s sake DON’T overcook it!). It takes approximately 1 hour. Remove the roast from the grill when it has reached the wanted temperature. Cover it with tin foil and let rest for 15-20 minutes before slicing it. While the meat is resting, you can prepare the bread and the beef stock. Slice the bread, and spread on some mayo on both sides. 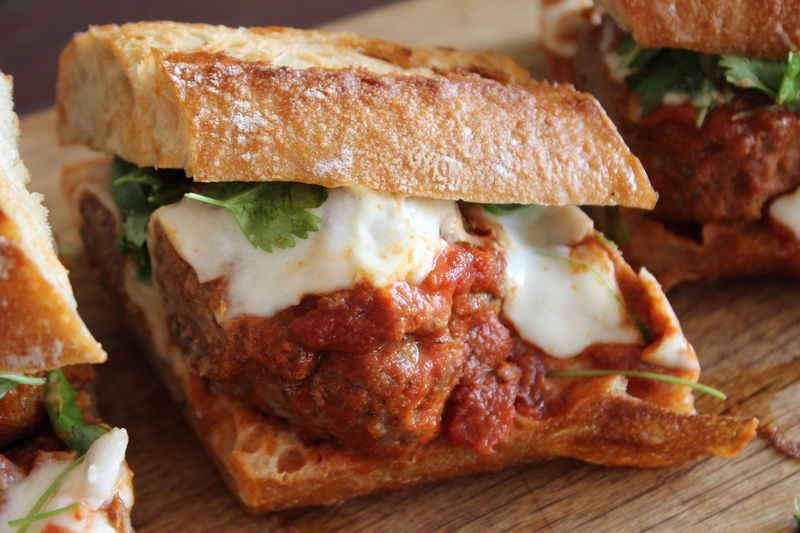 Place slices of fresh mozzarella cheese on the top half of the bread, and place it on the grill for a few minutes to let the cheese melt. Boil the beef stock at let it boil until it has reduced to half the amount. 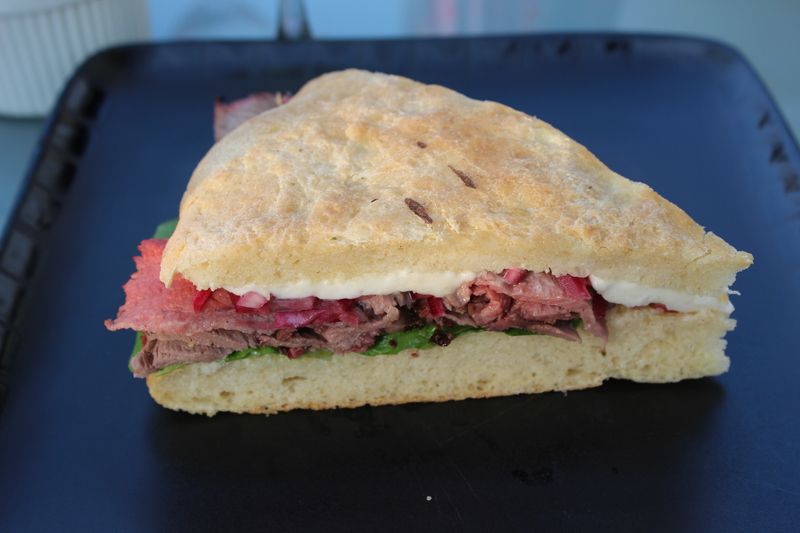 Place lettuce leaves on the bottom half of the bread. Cut the meat into paper thin slices and place it on top of the lettuce followed by meat juice from the tin foil and the marinated onions. Top it of the top half of the bread with melted cheese. 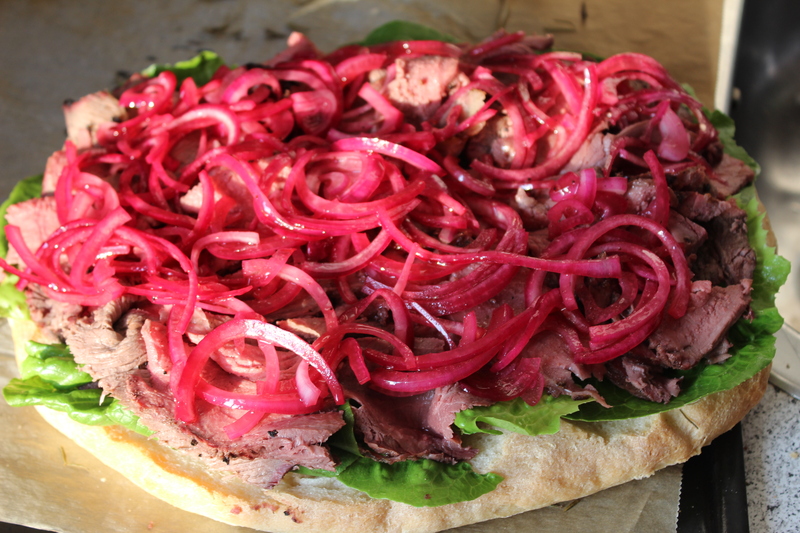 Cut the sandwich into 8 equally sized pieces and serve with the reduced beef stock as a dipping sauce. Dissolve the sugar in the vinegar. Mash the berries slightly with a fork and place them in a clean jar and pour the vinegar over. Close the jar, shake it a few times and set a side for 2 days. Shift the vinegar through an unbleached canvas to avoid that the berries get into the finished vinegar. Store in an air tight container for up to 2 month (in our household it only survives a few weeks :-D). 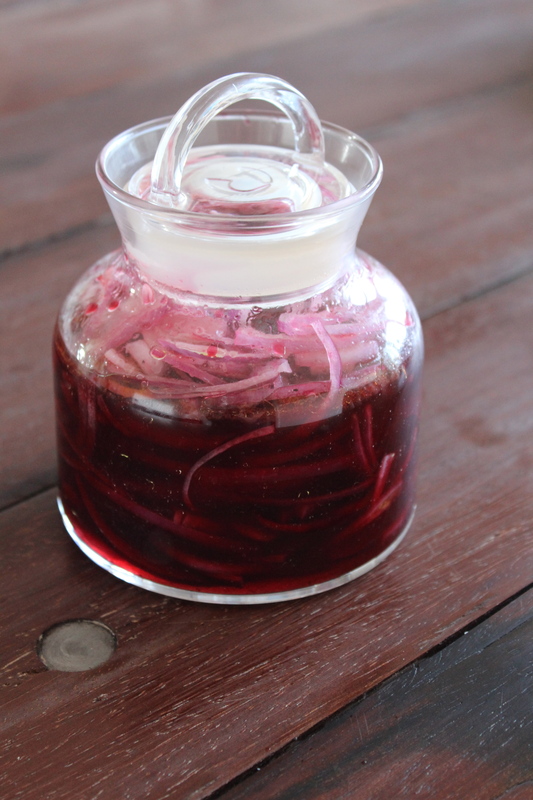 Now you that you have bought or made your own vinegar, you are ready to make the best marinated onions in the entire world! 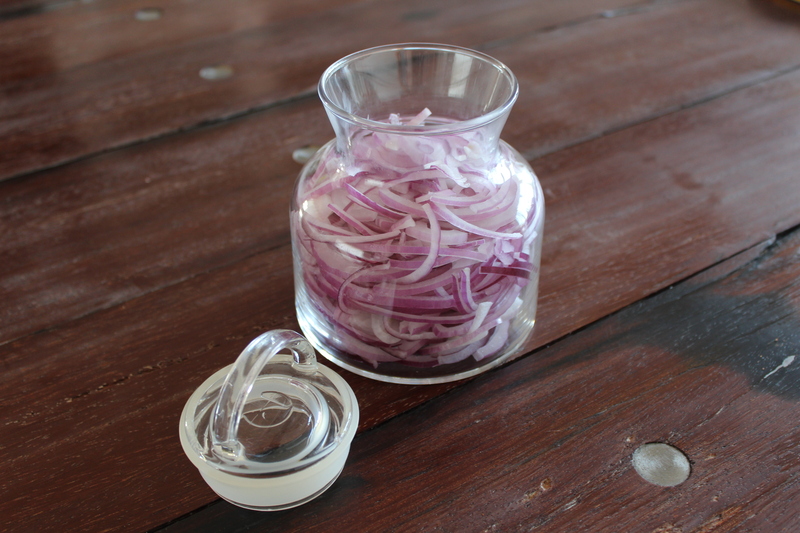 Slice (or chop) the onions and place in a clean jar. Combine vinegar, oil and honey and stir until the honey has dissolved. Taste and season with salt and pepper if you find it necessary. These onions are so delicious, and we often use them in both salads, in sandwiches, together with a steak or as side dish for tapas. 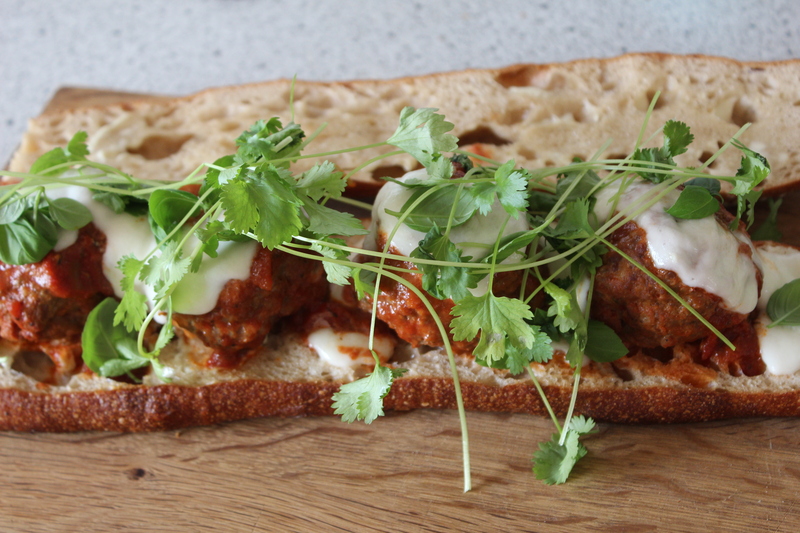 Most often we use the bread for sandwiches, but it is also great for tapas and/or to bring on a picnic with friends and family. 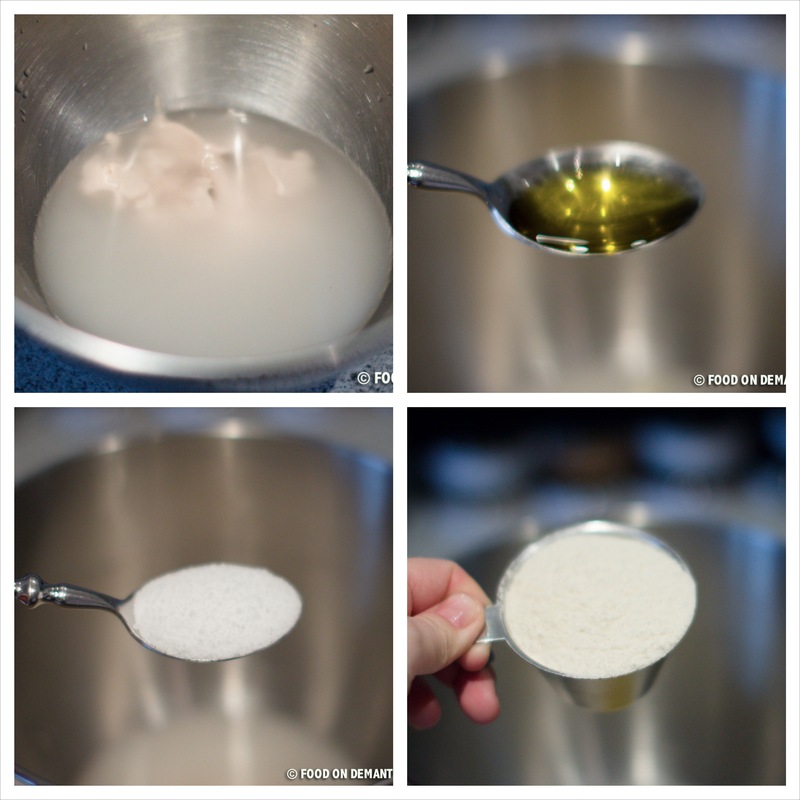 Dissolve the yeast into the water and add both flour types together with the coarse salt and half of the olive oil. Knead until the dough is smooth – it should be moist, but not sticky. 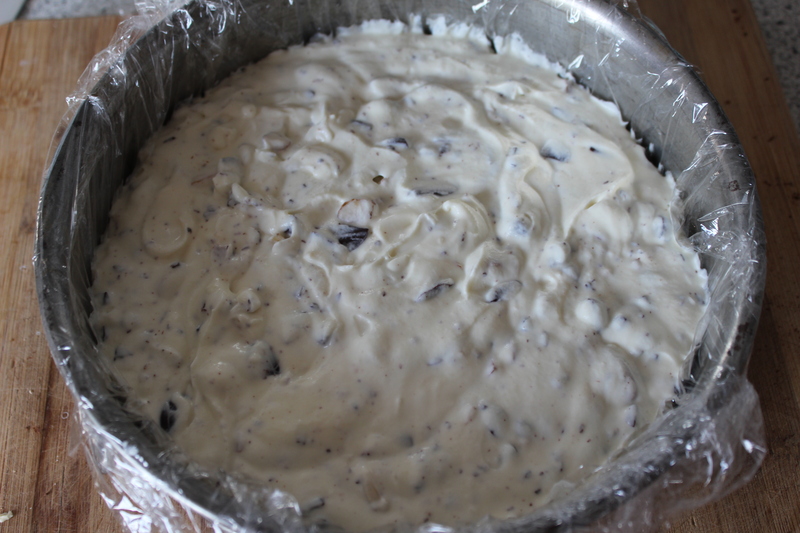 Place the dough in a greased bowl and cover with plastic wrap. Let raise to double size, approximately one hour. Form the raised dough into a ball and place it on a piece of baking paper. Pour the remaining olive oil over the dough and use your fingers to form the bread. It should end up being approximately 1 inch thick. 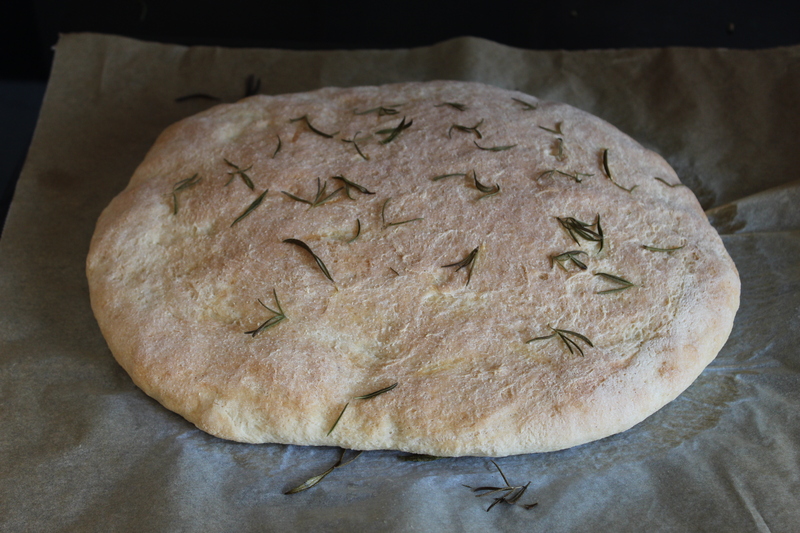 Sprinkle with your choice of herbs and cover the bread with a dishcloth. Let raise for additional 45-60 minutes. Sprinkle the sea salt on top of the bread and bake in the oven at 480F for 18 minutes. Last night we were having guest for dinner and I had been speculating for days about what dessert to serve. Normally I would have baked a cake, as they are some of my greatest cake fans :-D, but it has been quite warm these past days so I wanted to make something more refreshing. It turned out to be great, but I must admit that it would have been better, had I made it on an ice cream machine – but that is still on the ‘to-buy-list’, so I will have to settle with the old freezer method for a while yet So if you have an ice cream machine, you should use that, but this method can be used as well! Roast the almonds on a dry pan at medium heat for 5-10 minutes. Stir occasionally to avoid burning. The almonds a ready when you can begin to smell a nutty aroma in the kitchen. Set a side to cool down. Chop the roasted almonds and the chocolate into medium sized chunks (or what ever you prefer). 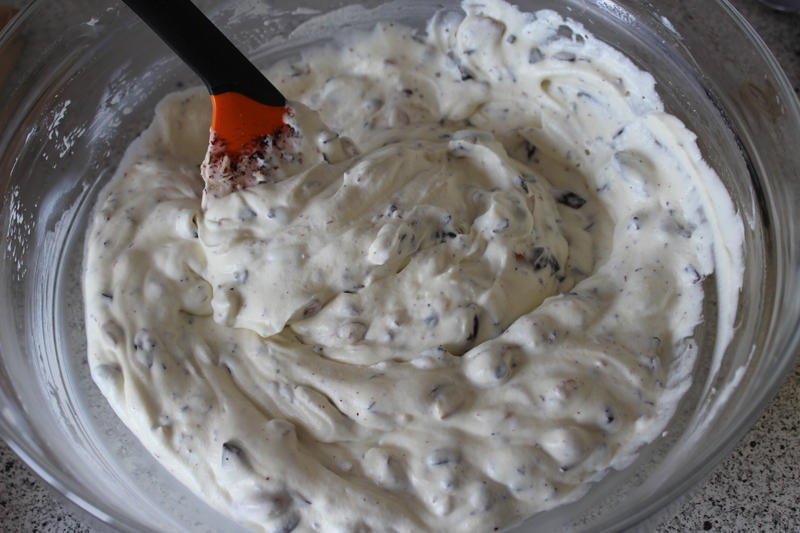 Place ricotta cheese in a mixing bowl and stir with a rubber spatula until smooth. Add sugar and stir again until the sugar has dissolved – it takes a few minutes. Set aside. 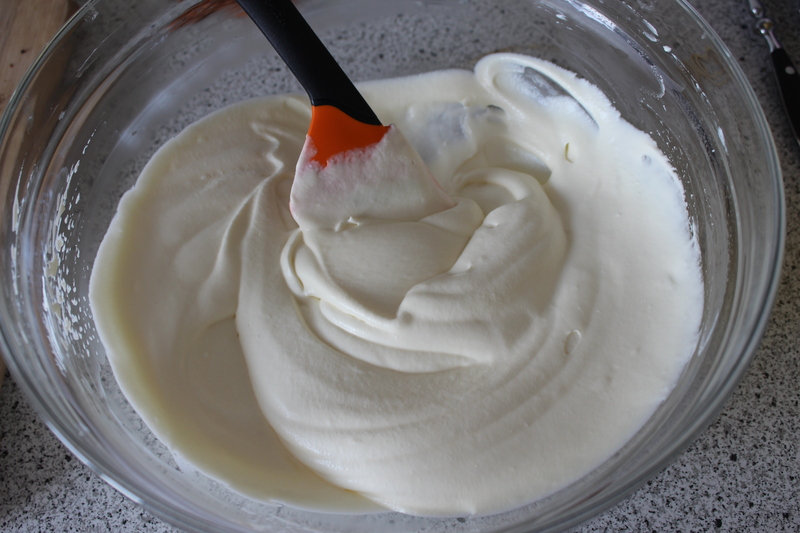 Whisk the cream until it forms soft peaks. Be very careful not to over-whisk it, as it might ruin the end result. 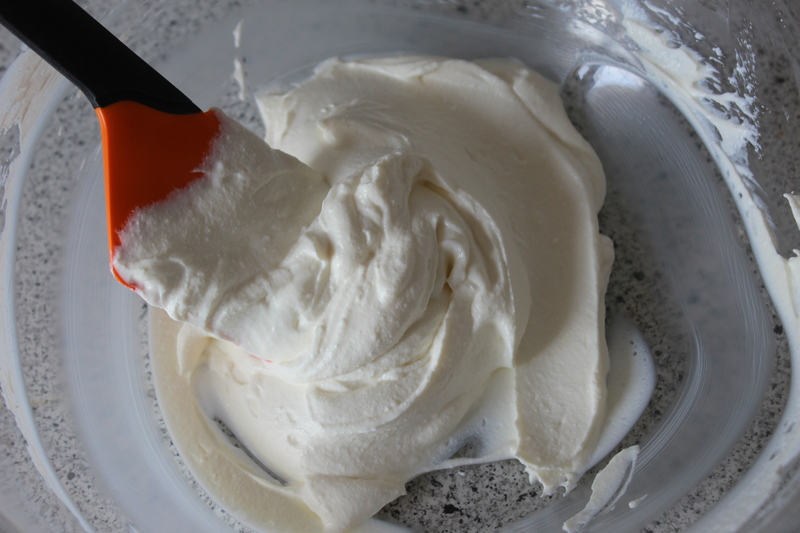 Carefully turn the whipped cream into the ricotta and fold until evenly combined. 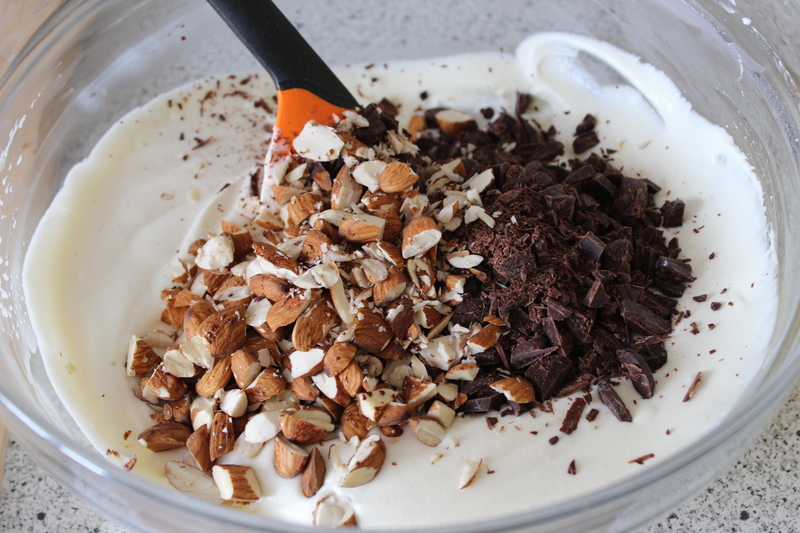 Then add the chopped chocolate and almonds and fold again. 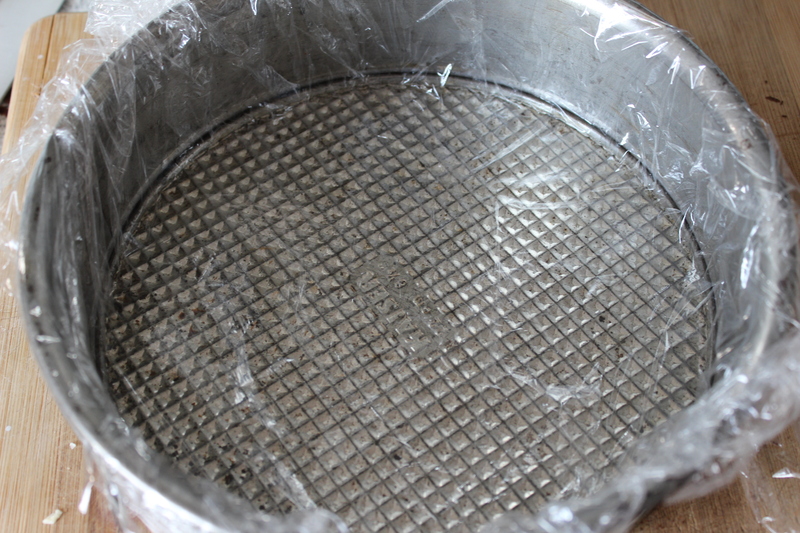 Cover a springform pan with plastic wrap and make sure that it covers the sides too. Pour the ricotta cream into the form and cover with yet a layer of plastic wrap. 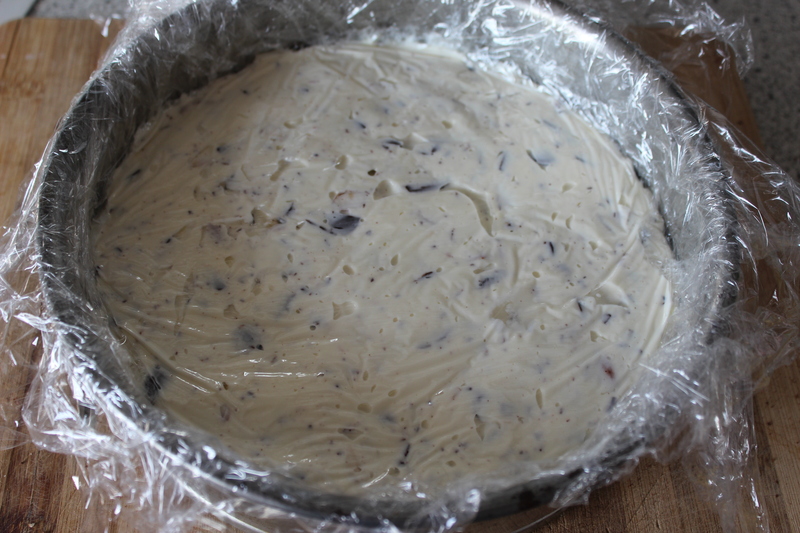 Make sure that the plastic wrap lies down close to the ricotta mass and up the sides of the form. Freeze for at least 12 hours before serving. 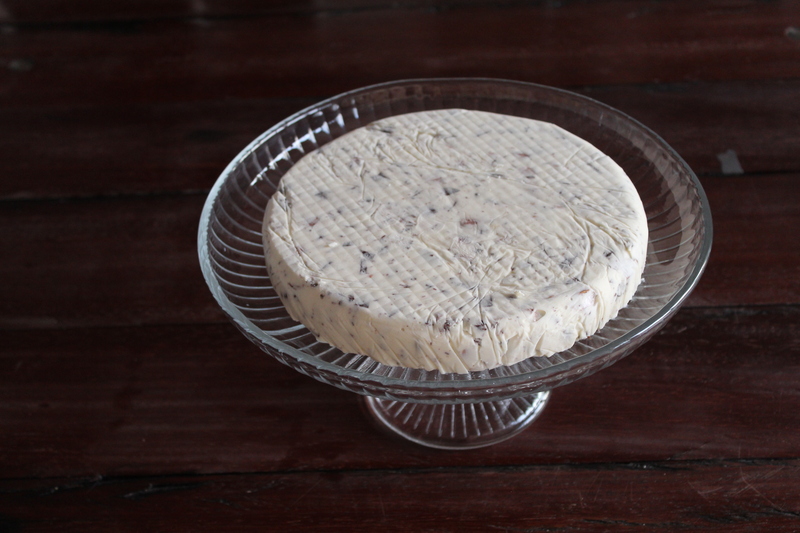 Take the ricotta ice cream out of the freezer approximately 10 minutes before serving. 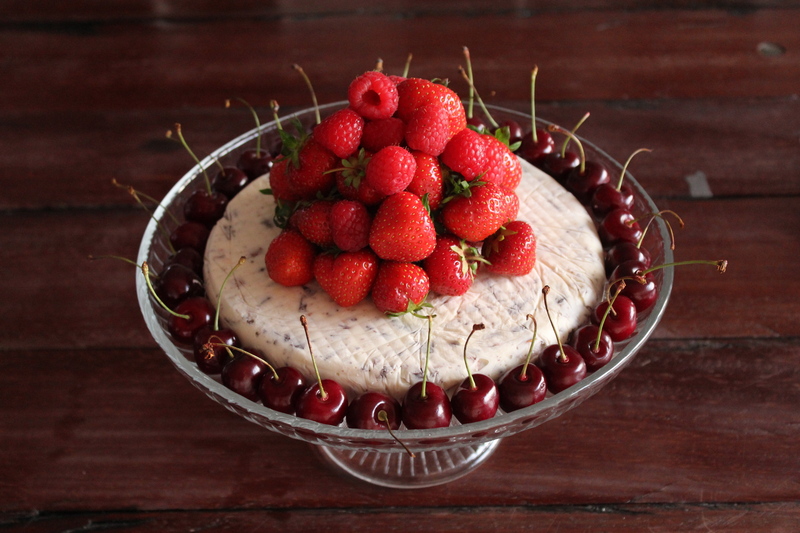 Remove both the form and the plastic wrap and place on a cake stand and decorate with cherries, strawberries and a few raspberries. As we wrote in the last entry on elderflower drinks, we have a sunday tradition with a couple of friends. Most sundays we end up making some kind of comfort food, like burgers, Sloppy Joe’s, chili dogs or some kind of sandwich. 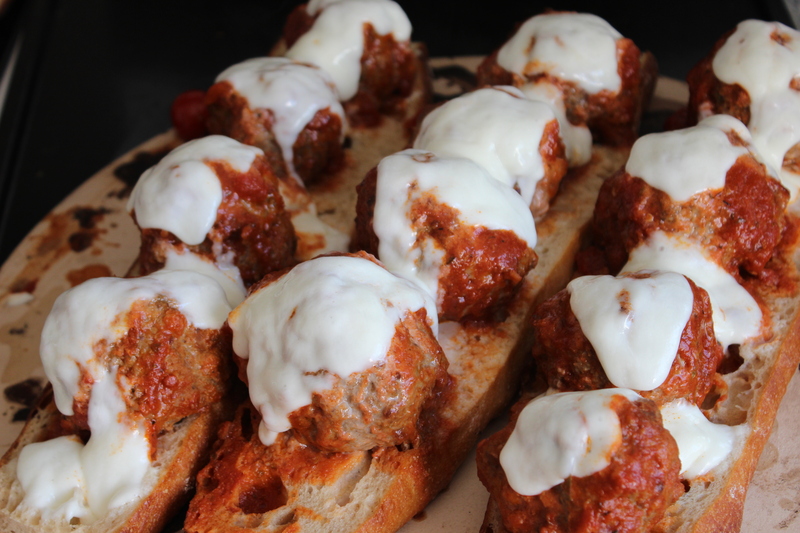 Last sunday we decided to make Italian meatball sandwiches (as we, Chris and I, are planning a trip to Tuscany later this summer), and they turned out to be great – as usual 🙂 Actually they were so great, that the guys eat way too much and ended up sitting in our bathing pool in their underwear, complaining about stomach pain (we will spare you the actual picture of this ;-)). Out of the 8 ‘small’ sandwiches you will get from this recipe, we ate it all – which explains the stomach pain – but all four of us are ‘heavy-eaters’ when it comes to good food, so you might have food enough for 6-8 people, depending on their sandwich-hunger 😀 Hope that you will try the recipe and enjoy it as much as we do! 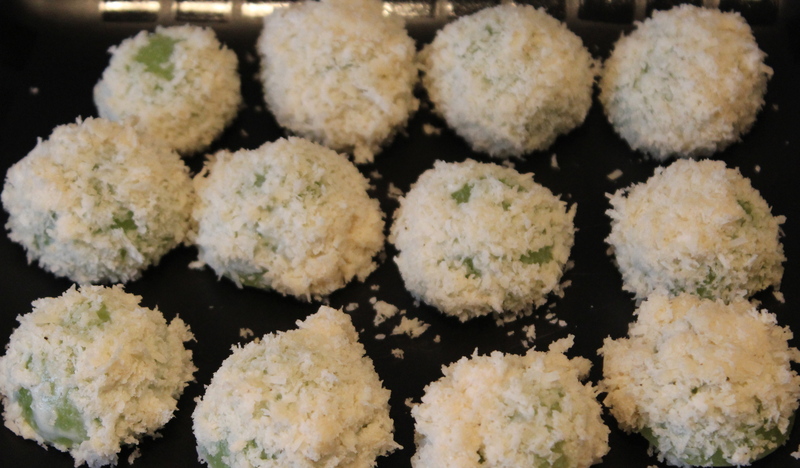 Combine breadcrumbs and milk in a mixing ball and make sure that all the crumbs get soaked. Set aside while chopping the shallots, garlic, feta cheese, thyme and rosemary. 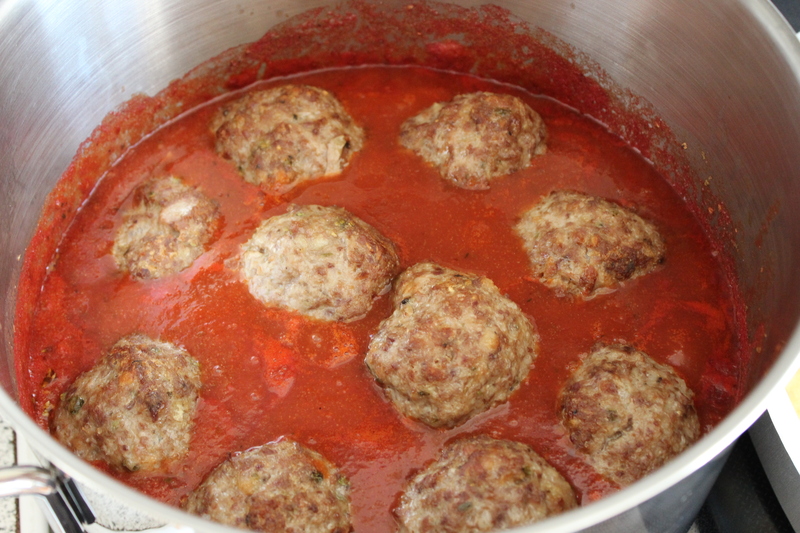 In a large mixing bowl, combine all the ingredients for the meatballs. Mix well using your fingers, as it will give the best result. 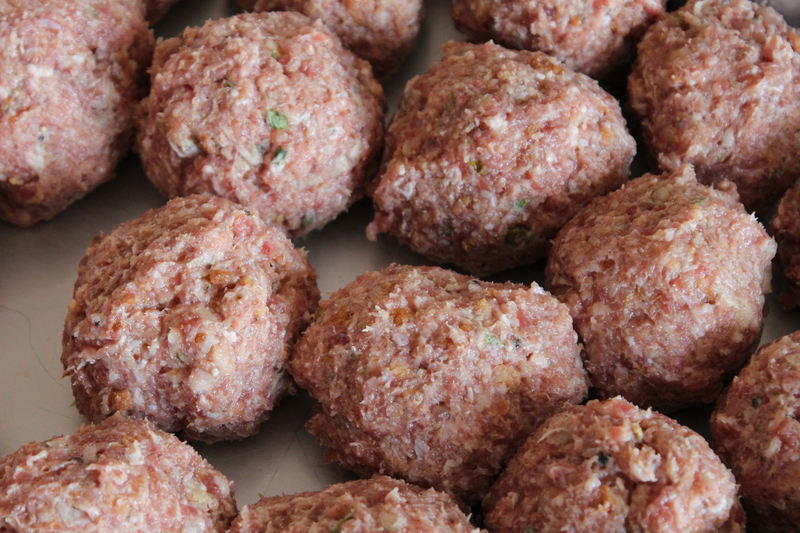 Divide the meat into 8 equally sized meatballs, approximately the size of a baseball. 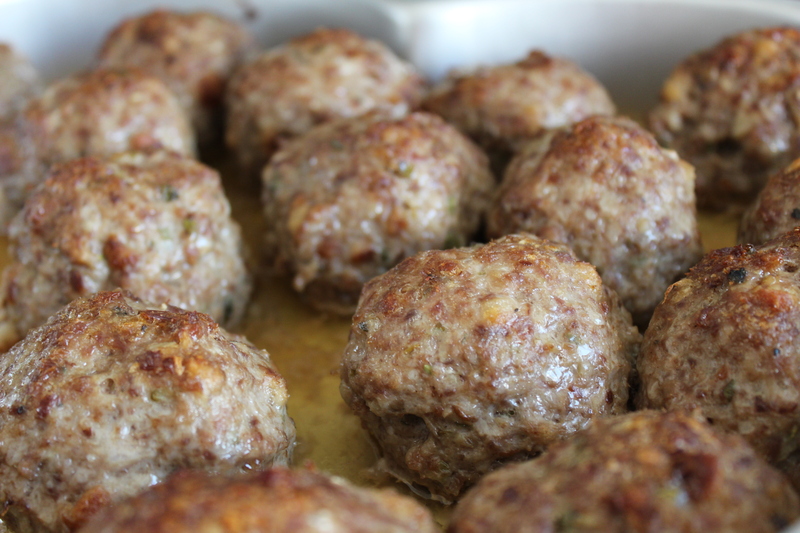 Place in a greased ovenproof dish and bake in the oven at 350F until the reach 165F – approximately 40 minutes.